PLANTanswers: Plant Answers > Questions with Photos Index: Cicada Killer Wasps--Do they sting? 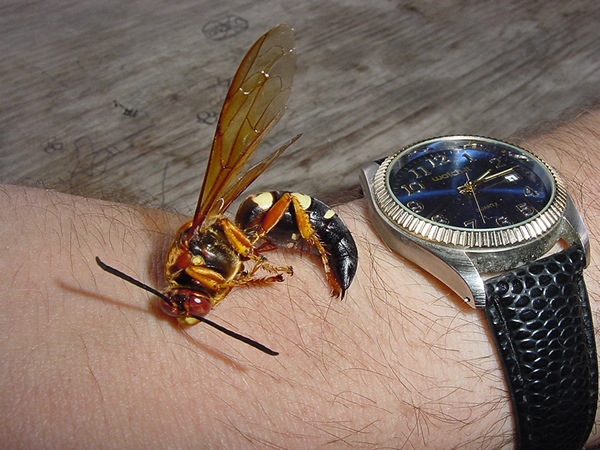 Plant Answers > Questions with Photos Index: Cicada Killer Wasps--Do they sting? Milton seems so contented when he doesn't know the cicada killer is close! Then Milton becomes a bit anxious!! Then realizes these gentle wasps don't sting!! What is that at the end of her abdomen! they sting? They look big enough to kill!! How can I get rid of them? ANSWER: These giant wasps are Cicada killers (Sphecius speciosus) and are related to mud daubers or dirt daubers on the wasp family tree. They average greater than one inch in length and are recognized by their amber-colored wings and yellow/orange/black bodies. 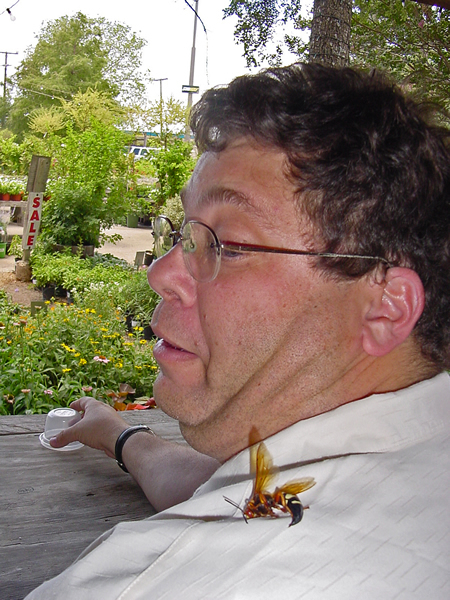 Cicada killers' size leads one to believe that they are aggressive and dangerous. They are frequently seen zooming around just above the grass or soil and sometimes they are observed crashing into windows. These patrolling behaviors are exhibited by the male cicada killer. Males patrol territories for females and will chase other males away; hence the window-crashing behavior when they see their reflection. 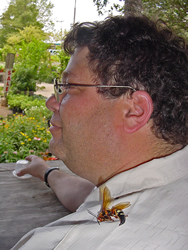 Above all of this, male cicada killers do not possess a stinger and, therefore, cannot sting. The female does have a stinger and can cause pain if hard pressed, if you know what I mean. ways to deal with cicada killers. The first is a non-chemical option that uses weed-blocking landscape fabric to deter any further digging in the area. Unfortunately, if the area is already planted, it is difficult to put a weed-blocking fabric in place. So that means one must use the second option of applying a insecticidal dust. I told him to find the active tunnels and apply a small amount (one or two teaspoons) of any dust insecticide such as Orthene to the tunnel opening, but DO NOT close the tunnel. This will allow the cicada killer to track the dust into the tunnel. Sprays or granules will provide some benefit, but not as well as dust insecticides. Some find a tennis racket is ideal for swatting the innocent critters.